One the tastiest dishes and your favorite recipes will be entered into your own copy of the Thanksgiving Food Prep Templates. 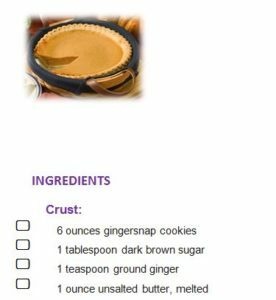 Below is a set of templates that give you detailed instructions for making the most common dishes this holiday season. You will blow guests away with the items on this menu. This set of templates, given below, has all the items you need to set a delectable table this year. With each document, you will receive a delicious image of the meal, a list of ingredients, and a set of directions to make the meal just the way you see it. You’ll also see some helpful information, such as the cook and prep time. To get started with this free template today, just follow the instructions below. When you scroll to the bottom of the page, you’ll be given a variety of choices to select from. We suggest downloading them all. Each template has the name of the meal listed as well. This way, you know exactly what you’re downloading. Open one of the documents to see what you need. Start a separate shopping list to get all these items at the same time as well. The first section is a list of ingredients and the second section is how you will prepare the items, follows by a detailed guide below. You can use the ingredients list to make a shopping excursion and then use the guide to make the recipe. There’s nothing else to this simple Thanksgiving template. You have the power to make this Thanksgiving a year to remember for both friends and family. To get started today, simply follow the links below.